Thaw the spinach, cook and then puree it, which makes quite a bit of water disappear already. 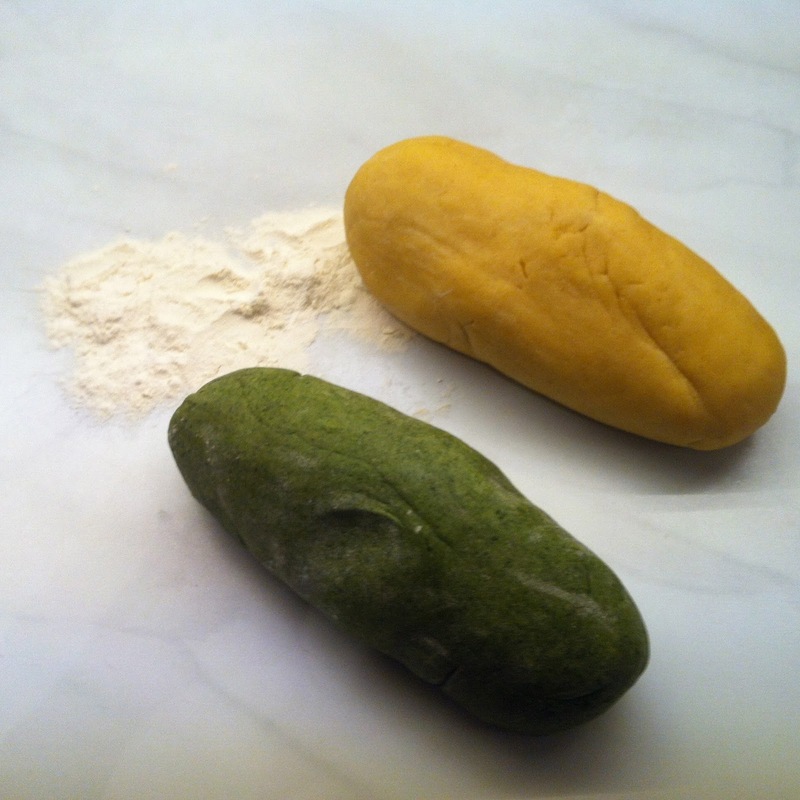 Mix all the ingredients with the K-hook and then with the dough hook of Kitty into a smooth, elastic dough, it helps if you add the olive oil only at the end. Cut the dough into 4 parts and individually push each part through the pasta machine. I tried two ways to produce striped pasta: the stacking and the sticking method. For the stacking method, roll out equal amounts of white and green dough and stack the pieces of colored dough, then cut of a piece across the stack the strip off a piece and roll this out thinly. From this striped piece you get a long, striped stripe thanks pasta machine. That piece is then cut small in small rectangles, which are pressed together in the middle to form farfalle (butterflies) or bows. For the sticking method, take some strips of one color, which are already rolled out to the final thickness (I used "7"), and use a bit of water stick them to a wider strip of the other color in the same thickness. 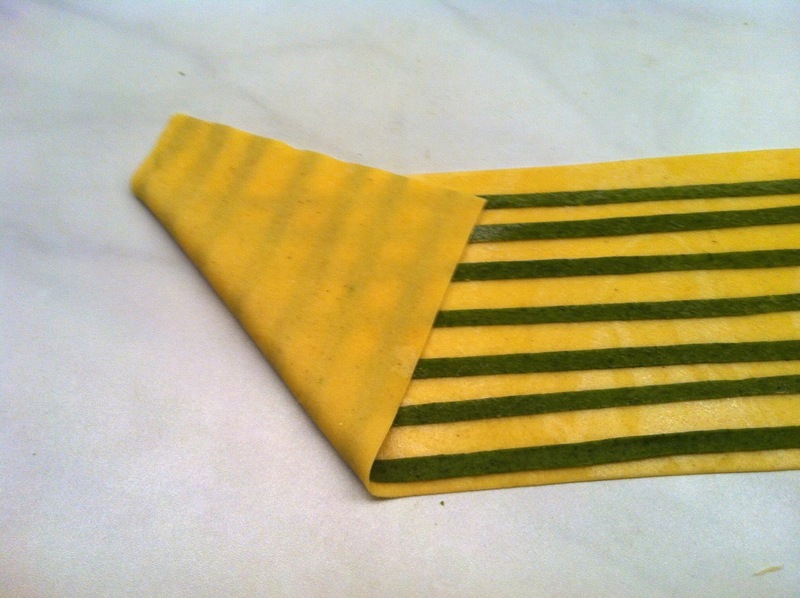 The same wide strips you get just from the use of cutting-Tagliatelle pasta machine. For the stripes of the same width, use the tagliatelle cutter of the pasta machine! Dry the sticked stack for a little bit, push through the pasta machine again et voilà! In contrast to the stack method, this pasta is only striped on one side, but the stripes are neater than with the stacking method! 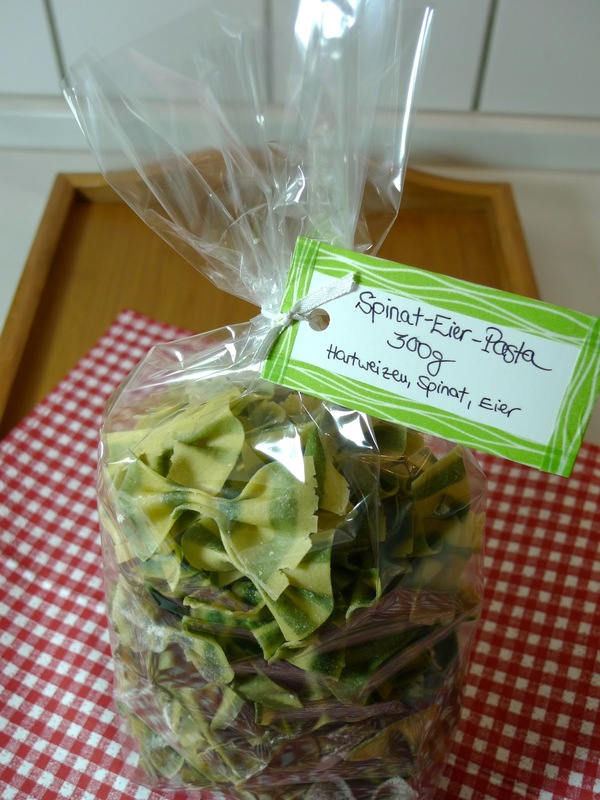 You can dry the farfalle rather quickly and easily on a floured kitchen towel. 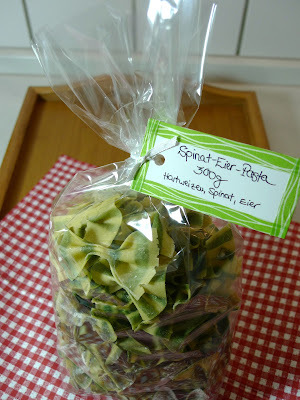 If you want dry tagliatelle, you can make pasta nests or dry them straight on a clothes line quite well. 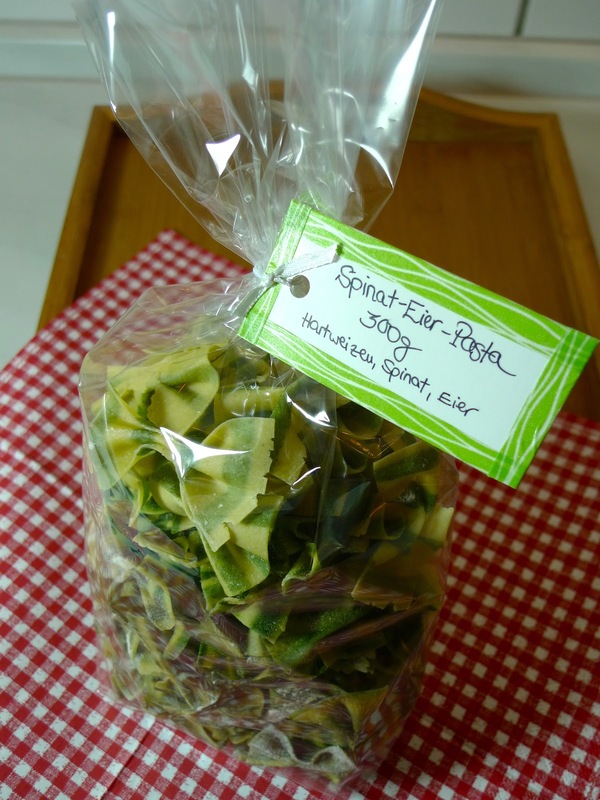 Take care with pasta nests, they like to get moldy - wrap the nest very loosely, let the tagliatelle dry before forming the nests already, and place the nests on a floured cloth and not on a flat, smooth surface to dry! 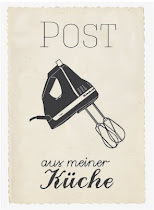 When using a clothes line, the thicker ribs are the best, such that the noodles do not break at the fold and fall down. I cushion the strut additionally with kitchen towels or pot holders. I always pack the dried noodles in cellophane bags. For the tagliatelle, I might need some slightly longer bags next time, with these I have to break off the longer pieces of pasta.